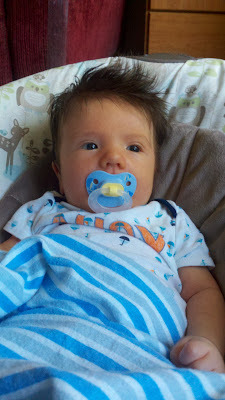 The Blog Formerly Known as Funemployment: 7/19/12 - If you forget to blog about it, does that mean it never happened? 7/19/12 - If you forget to blog about it, does that mean it never happened? I realized with alarm just now that I'd forgotten to write my blog yesterday. So there was no entry for Thursday. I was so confused. "Wait a minute, today's the 21st, and my last entry is the 18th? What happened to Thursday, OH MY GOD!" It's traumatic, thinking you've been abducted by aliens, or perhaps glamoured by vampires into forgetting an entire day of your life. But then I remembered that I went to Jessie's on Thursday, where there were no vampires, only cute things like cats and a baby and Jessie. Bebeh! This little dude fell asleep in my arms for about 20 minutes like a drunken koala. Cute!